Rat anti Human CD59 antibody, clone YTH53.1 recognizes the human CD59 cell surface antigen, also known as MAC-inhibitory protein, 1F5 antigen, 20 kDa homologous restriction factor, MEM43 antigen, membrane attack complex inhibition factor, membrane inhibitor of reactive lysis or protectin. CD59 is produced as a 103 amino acid proprotein, further processed to produce an 18-20 kDa GPI linked glycoprotein broadly expressed by human leucocytes and erythrocytes. Mutation of the CD59 gene can result in the presentation of Hemolytic anemia, CD59-mediated, with or without polyneuropathy (HACD59) a disease characterized by infantile onset of a relapsing-remitting polyneuropathy manifest as limb muscle weakness, and hyporeflexia. Rat anti Human CD59 antibody, clone YTH53.1 blocks the normal function of CD59 (Walsh et al. 1991). Human Peripheral Blood T cells. 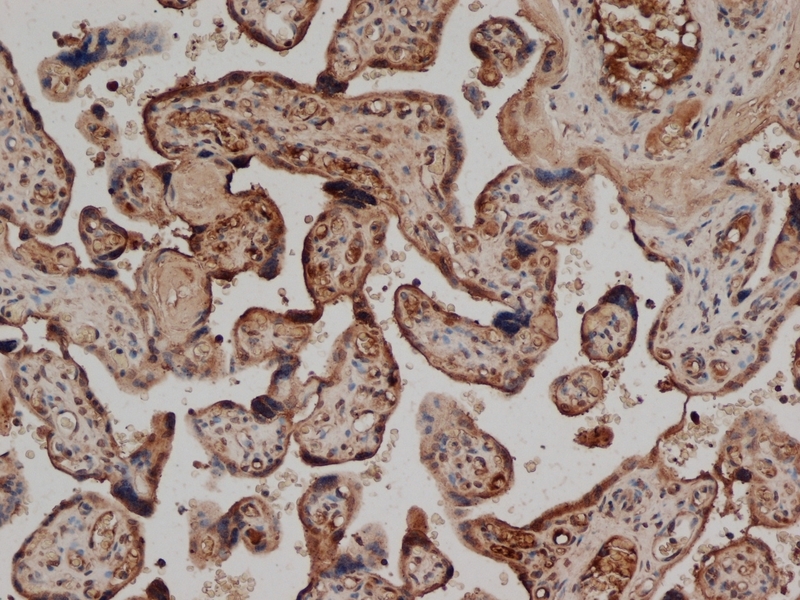 Spleen cells from an immunised DA rat were fused with cells of the Y3/Ag1.2.3 rat myeloma cell line. 1This product contains sodium azide, removal by dialysis is recommended prior to use in functional assays. Bio-Rad recommend the use of EQU003 for this purpose. 2 This product requires antigen retrieval using heat treatment prior to staining of paraffin sections. Sodium citrate buffer pH 6.0 is recommended for this purpose. Use 10ul of the suggested working dilution to label 106 cells in 100ul. We do not recommend using this antibody in lysed whole blood techniques due to inhibition of staining caused by CD59 expression on erythrocytes. Davies, A. et al. (1989) CD59, an LY-6-like protein expressed in human lymphoid cells, regulates the action of the complement membrane attack complex on homologous cells. J Exp Med. 170 (3): 637-54. Walsh, L.A. et al. (1991) Transfection of human CD59 complementary DNA into rat cells confers resistance to human complement. Eur J Immunol. 21 (3): 847-50. Davies, A. et al. (1995) Identification of MIC 11 antigen as an epitope of the CD59 molecule. Ellison BS et al. (2007) Complement susceptibility in glutamine deprived breast cancer cells. Ajona, D. et al. (2007) Down-regulation of human complement factor H sensitizes non-small cell lung cancer cells to complement attack and reduces in vivo tumor growth. J Immunol. 178 (9): 5991-8. Yang, P. et al. (2009) Expression and modulation of RPE cell membrane complement regulatory proteins. Invest Ophthalmol Vis Sci. 50: 3473-81. Hosokawa, M. et al. (2004) Human oligodendroglial cells express low levels of C1 inhibitor and membrane cofactor protein mRNAs. Koch, N. et al. (2009) IL-10 protects monocytes and macrophages from complement-mediated lysis. J Leukoc Biol. 86: 155-66.